Lucian Freud is regarded as one of the greatest artists of the 20th century - perhaps the greatest British contemporary artist. This status has been confirmed by sales such as that of $5m for his Boy's Head at Sotheby's. He was also a great printmaker, and this week a collection of 44 prints belonging to his friend Magar 'Marc' Balakjian went under the hammer at Christie's. The event was a great success, with all but six of the lots sold - 91% by value - with another world record set for a print by the artist at auction. The top two lots were Woman with an Arm Tattoo and Eli. The former was an etching of a sitter named Sue Tilley, who was also the subject of his famous painting Benefits Supervisor Sleeping which sold for a World Record price of £20.6m in 2008. The print doubled its £30,000-50,000 listing to bring £121,250. 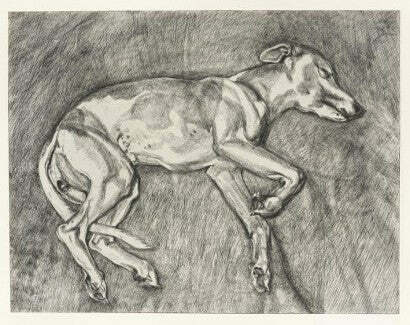 However it was Freud's Eli - a print of a prostrate dog - which broke the record, trouncing its £50,000-70,000 listing to bring a final bid of £145,250. "This morning's highly successful sale was a tribute to Lucian Freud who was not only a painter of immense talent, but also an inspired printmaker. It was likewise a tribute to Marc Balakjian, the master printer who worked with Freud for the last twenty five years and from whose collection the sale came." In total the auction raised just under £1.5m. Collectors on the lookout for works by the 20th century's greatest artists are in luck, as there is also the opportunity to buy a wonderful sketch by Salvador Dali from our stock, which qualifies for our unique 120% guarantee.